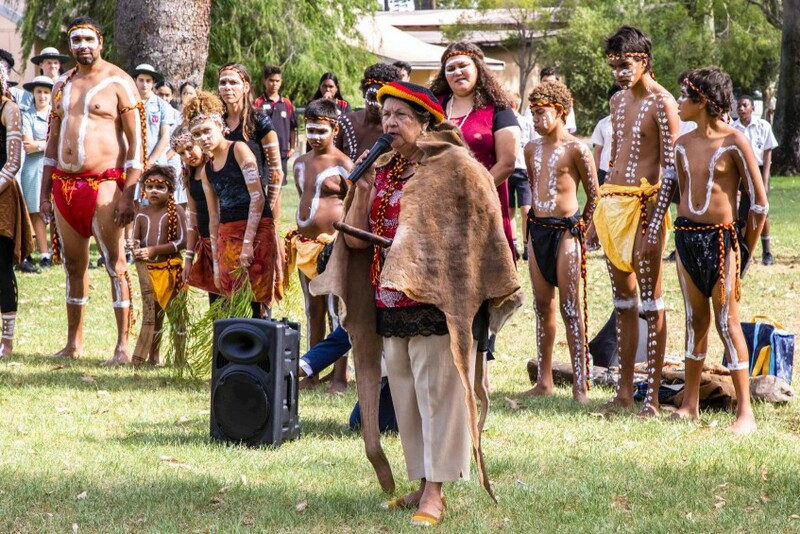 Aunty Marie Taylor conducts the Welcome to Country on the schools launch of Project Compassion for 2019 at Clontarf Aboriginal College on Tuesday 5 March. Photo: Jamie O’Brien. 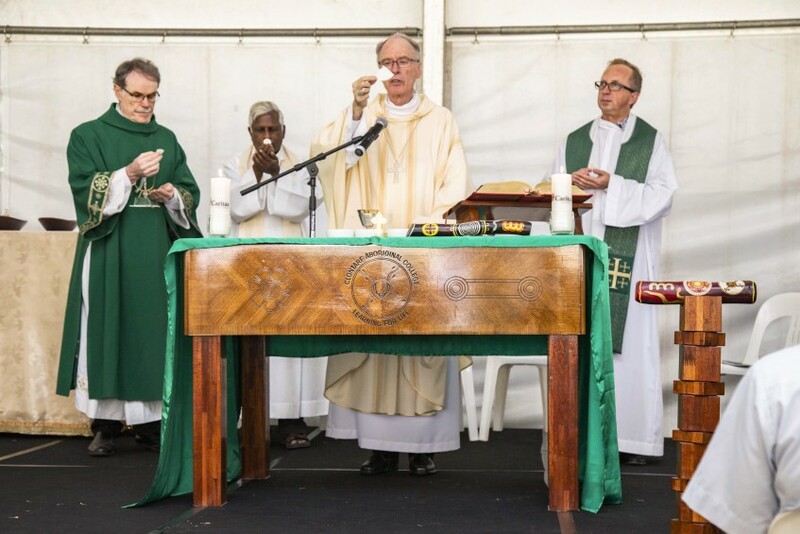 More than 300 students, teachers and representatives of the Perth Catholic community gathered on Tuesday 5 March for the Mass and cultural welcoming at Clontarf Aboriginal College. The occasion commenced with a Welcome to Country by Aboriginal Elder Aunty Marie Taylor, and included tribal dances of the Wadjuk Noongar people, followed by Mass celebrated by Auxiliary Bishop Don Sproxton and concelebrated by Aboriginal Catholic Ministry Chaplain Fr Sebastian Fernando, Salvatorian Superior General Fr George Kolodziej SDS and assisted by Caritas Australia Perth Diocesan Director, Deacon Paul Reid. Deacon Paul Reid, Fr Sebastian Fernando, Bishop Don Sproxton and Fr George Kolodziej during the consecration for the Mass marking the start of Project Compassion for 2019. Photo: Eric Martin. 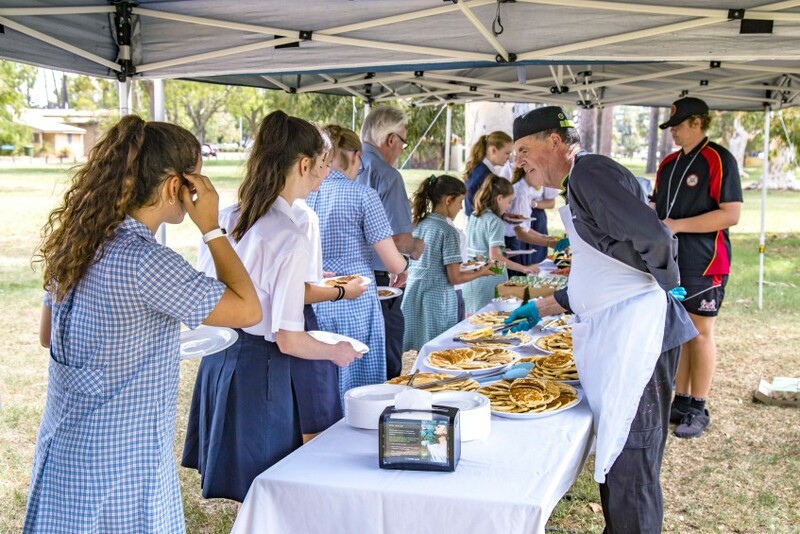 Guests were welcomed to the Mass, which was held in a large open tent on the school grounds, by Clontarf Principal Troy Hayter and Religious Education Coordinator Salvatore de Luca. In his homily for the occasion, Bishop Sproxton said that even though we are different, even though we come with different traditions, with different customs, different languages, yet we become brothers and sisters through the work of Jesus in our lives. Clontarf Principal Troy Hayter welcomes guests to the Mass, marking the start of Project Compassion for 2019. Photo: Jamie O’Brien. “As we heard during the season of Lent we engage in works of charity, works of penance and special prayer. This enables us then to be ready for the great celebration of Easter, the celebration of the victory of Christ over everything that means death to us,” Bishop Sproxton said. “So as we now prepare to celebrate this Mass, a Mass with which we also begin this season of Lent, but also begin this special time of looking beyond ourselves towards others, this time of becoming involved in Project Compassion. “And therefore we are able to be one with people here in Australia and people from other lands in suffering. So we acknowledge our sins and we prepare ourselves to celebrate the Sacraments,” he said. Guests were treated to pancakes to celebrate Shrove Tuesday. Photo: Eric Martin. At the conclusion of Mass, guests were also treated to pancakes by the College to celebrate Shrove Tuesday, the day before Ash Wednesday. The social gathering was then followed by presentations from Catholic Education Western Australia (CEWA) Executive Director Dr Debra Sayce and Deacon Paul Reid, in addition to a special guest presentation from Yohanes Baskoro (known as Baskoro), the 2019 Project Compassion speaker and Caritas Indonesia (Karina) Program Manager. “I love to meet so many people, listen to them, to communicate, and to tell stories from my writings and photos,” Baskoro said. 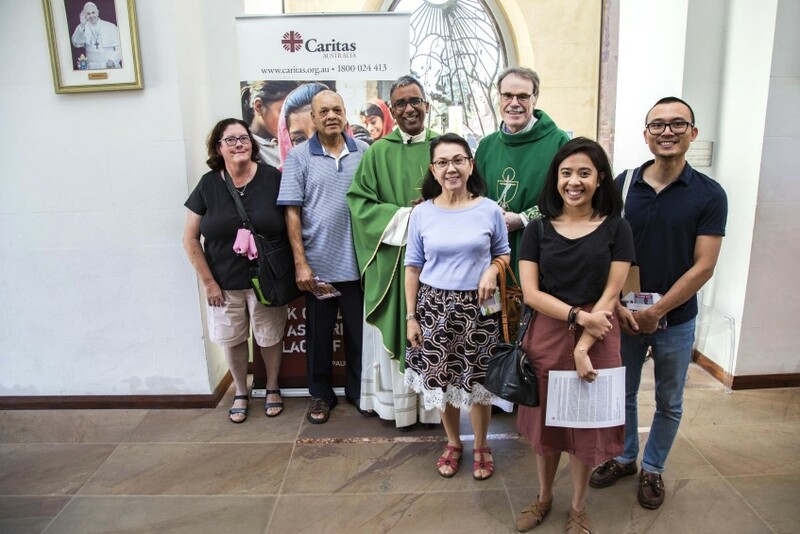 St Mary’s Cathedral parishioners pose with Cathedral Dean Fr Sean Fernandez and Caristas Australia Perth Director, Deacon Paul Reid, on the parishes launch of Project Compassion for 2019, Sunday 3 March. Photo: Jamie O’Brien. 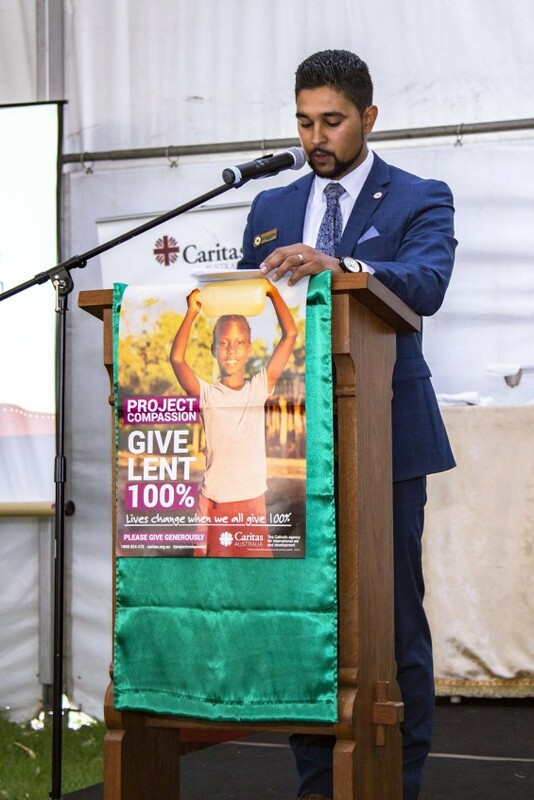 With its partners on the ground, Baskoro has worked with Caritas Australia to promote disaster preparedness. In the last year alone, five major natural disasters have hit Indonesia, including the Sunda Strait Tsunami, Sulawesi and Lombok earthquakes, landslide and flooding in Jakarta and a Tornado in West Java. “We developed community radio system near the hazard prone area to increase people’s awareness and preparedness in facing the eruption (of Mount Merapi, central Java) as a future hazard,” Baskoro explained.